Covering an Area of 7629Sq.Km spanning Manang, Kaski, Myagdi & Lamjung Districts Annapurna Conservation Area is Nepal‘s largest protected area. The altitude varies from 790 m to 8091m at the Peak of Annapurna. Established in the year 1985 the Annapurna Conservation Area managed by the National trust for Nature conservation, was officially recognized in the year 1992. While much of the Trekking Trails offer mild to moderate trekking. There are some stretches of the trail which are steep and even more once you get into Annapurna Sanctuary. 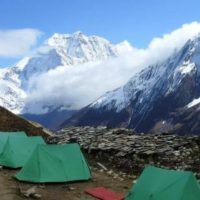 The truth about trekking in Nepal is more about Mt.Annapurna and its surroundings. Because of the wide range of elevation the Conservation Area offers from short treks to moderate and strenous treks. In a matter of days one can pass from oak and rhododendron forests to icy wind swept terrain. But the altitude gain is gradual, so acclimatization is easier. Annapurna at 8091m is no midget, but one can always try Annapurna Base camp. 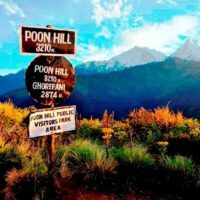 Every Trek Route in this region is dominated by Views of the Annapurna Range, whether one is going up to base camp or just doing a short Village Trek. The Annapurna massif which runs 55Km across is located east of the kali Gandaki River & boasts of six major peaks. The Kali Gandaki Gorge, deepest gorge in the world seperates the Annapurna Massiff from Dhaulagiri, the seventh tallest mountain in the world. 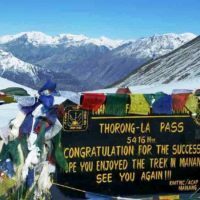 The Annapurna Circuit trek which circles the range is approximately 160Km-230km long.